He does not attempt to be authentic, but to show a core Native spirit. His Indians seem to belong to a universal tribe that suggests a common, Far Eastern origin, and connection with a contemporary group. John Nieto Indians are not idealized or troubled. They are potters, warriors, silversmiths or shamans in traditional garb, as well as indigenous wildlife, painted in brilliant, oddly paired colors and radiating a quiet dignity. He uses broad strokes and thick layers of brilliant colors with a halo of contrasting color traced around each figure. His electric hues are unmistakable. Nieto’s work reflects his upbringing from Hispanic and Indian-born parents. His distinct style comes not only from his native New Mexico, where he still lives, but also from a global awareness and travels to Europe. An artist of established international reputation, Nieto’s work has been exhibited in Europe, Japan, Latin America, and Africa, in addition to his annual shows in Santa Fe, New York and Palm Springs. 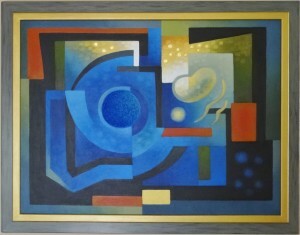 In 1981 his work was exhibited at the Salon D`Automne/Grand Palais in Paris, France. His work, the subject of two books and numerous articles, is also represented in the permanent collection of the National Museum of Wildlife Art. In 1994, Nieto received New Mexico’s Governor’s Award for achievement in the Arts. He has served on the Advisory Board of The Wheelwright Museum in Santa Fe, the Advisory Board of the Native American Preparatory School, and is a Regent at his alma mater, Southern Methodist University in Dallas, where he received his Bachelor of Arts Degree. John Nieto lives and works in Corrales, New Mexico, on the banks of the Rio Grande River.